Today I am bringing “Ordinary Love”, song by Irish rock band U2. It was written to honour Nelson Mandela and is included in the biography film Mandela: Long Walk to Freedom. It was released on 29 November 2013, less than a week before Mandela died. “This Is What You Came For” is a song by DJ Calvin Harris, featuring Rihanna. They had previously collaborated on her sixth studio album, Talk That Talk, which included US top five hit “Where Have You Been” (click here if you want to listen), the former of which was written and produced by Harris. “This Is What You Came For” received mixed reviews from critics. A music video for the song premiered on 17 June 2016 and features Rihanna in an open cube with images projected on the inside walls. Read more here. Do you want to feel this song? Click here to listen and sing! “Stronger (What Doesn’t Kill You)” is a song by American artist Kelly Clarkson and the titular song from her fifth studio album, Stronger (2011). If you really enjoy practicing English listening to music (like me! ), you cannot miss this website. LyricsTraining.com is a very fun and simple way to enhance your listening, reading and writing at the same time! First of all, you register using your e-mail or Facebook account. After that, you pick up a song of your choice. To give an example, I chose “When Love Takes Over” (David Guetta, feat. Kelly Rowland). What’s next? “Hello” is a song by English singer Adele. It was released on 23 October 2015 as the lead single from her third studio album, 25 (2015). It attained international commercial success reaching number one in almost every country it charted. In the United Kingdom, it became her second UK number-one single, following “Someone like You”. In the United States, “Hello” debuted atop the Billboard Hot 100, becoming her fourth number-one on the chart and breaking several records, including becoming the first song to sell over a million digital copies in a week. The music video for the song broke the Vevo Record by achieving over 27.7 million views within a 24-hour span. It also broke the record for shortest time to attain 100 million Vevo views. All less than 3 months after releasing! A huge success! Click here to listen to the song while you read the lyrics! Enjoy it! Royals is a song by New Zealand singer Lorde. It lyrically disapproves of the luxurious lifestyle of contemporary artists. It experienced international commercial success, peaking atop the record charts of many countries including Canada, Ireland, New Zealand and the United Kingdom. Lorde also became the first New Zealand solo act to top the Hot 100 in the U.S.
“Royals” also won numerous awards, including the Grammy Award for Song of the Year, Best Pop Solo Performance and the APRA Silver Scroll Award. Hi, everyone! How have you been? In my view, this is one of the most extraordinary songs EVER sung. Furthermore, the videoclip is indescribably touching. “Sugar” is a song recorded by American pop rock band Maroon 5 for their fifth studio album, V (2014). It was written by Adam Levine, Lukasz Gottwald, Jacob Kasher Hindlin and Mike Posner together with its producers Ammo and Cirkut. In the US, it peaked at number two on the Billboard Hot 100 and became the band’s third top 10 single from V, and eighth consecutive top 10 hit. Hey, everyone! How do you do? I love music in general but this song has a special meaning to me. “You Get What You Give” is a 1998 song by the New Radicals. It was an international hit, the first and most successful single from their album Maybe You’ve Been Brainwashed Too. “A Thousand Years” is a song by American singer-songwriter Christina Perri and David Hodges. It is taken from the album The Twilight Saga: Breaking Dawn — Part 1: Original Motion Picture Soundtrack. The song serves as the second single from the album and it was released as a digital download on October 18, 2011 worldwide. It was a huge success, once the melody is extremely adorable. However, something surprising happened. 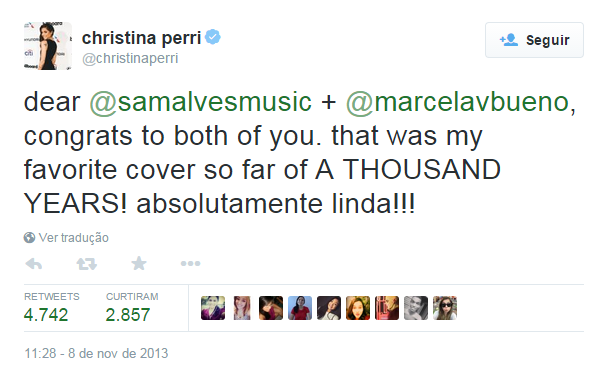 The song was covered by contestants Sam Alves and Marcela Bueno on the second season of The Voice Brasil. Well, and what happened? Perri kindly twitttered about it!!! !